One of the easiest ways to transform a bedroom into a warm and welcoming nursery is by covering the walls with quality wallpaper with an interesting floral pattern. Images of flowers can help soothe anxious parents while providing the baby’s developing brain with an array of shapes and colors to look at. Which floral patterns should you choose though? We’re here to help. Floral wallpapers come in a huge variety of colors and patterns. From small repetitive floral patterns to huge murals of colorful flowers. From realistic-looking flowers to contemporary gemoetric designs. As stand-alone large plant specimens or as part of a more intricate picture with other objects. 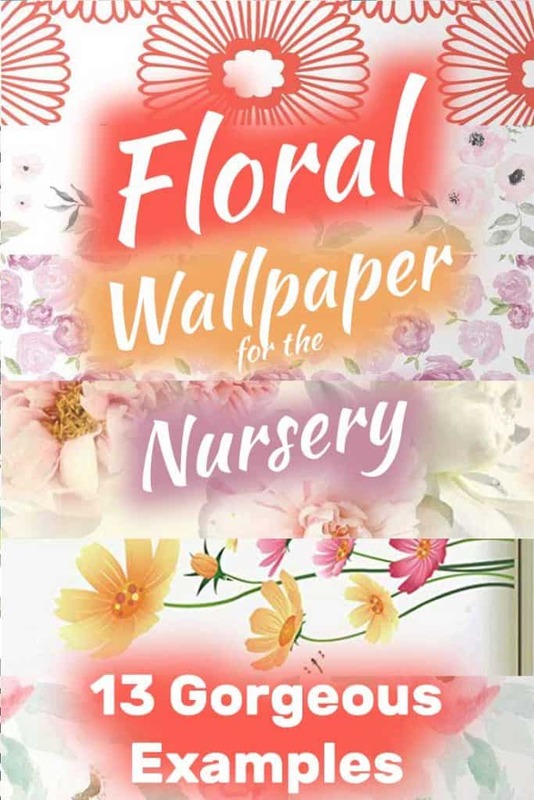 We’ve collected 13 examples of awesome floral wallpapers that would look perfect in a newly designed nursery, so let’s take a look. 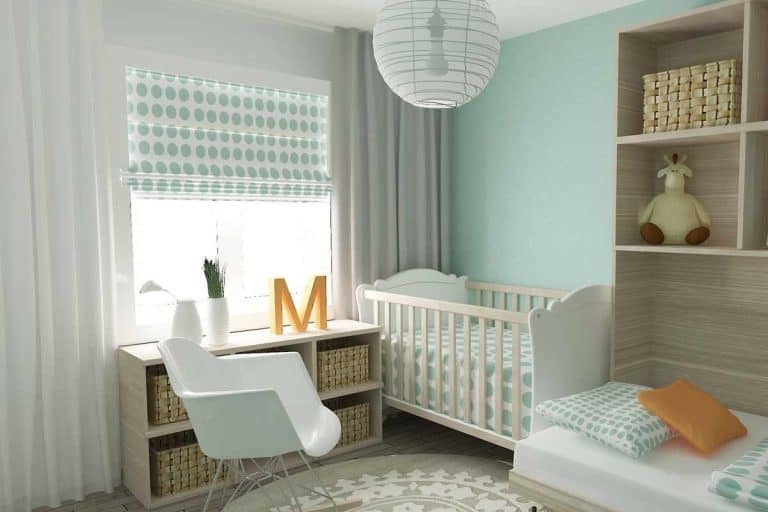 Nursery rooms can be difficult to decorate, especially when you have so many color pastels to choose from. This is why Spoonflower’s floral themed wallpaper is number one on our list because of its attractive design and simplicity. Each flower is carefully drawn against a bright white color. The green leaves are a nice touch to the brilliant strokes of pink, bringing in a diverse color palette. In addition, this wallpaper is also good for stimulating creativity in the mind of the little dreamers. The artist’s design fulfills your desire for floral patterns that will look good in just about any setting. This wallpaper can be easily installed and removed on any smooth, flat wall, leaving room for ample experimentation. Add a little more glamour to your nursery with this hot air balloon themed wallpaper. It is a good way to start a conversation with the little ones and teach them a thing or two about animals and flying. The artist generously drew several flying objects against a sky that seems to be at peace with itself. Murwall is a well-respected company in the wallpaper market and has an excellent lineup of products. This wallpaper includes all the telltale marks of the wallpapers manufactured by the company, and this includes resistance to outside elements such as UV rays, fire, and water. HP Latex Ink is used to ensure that the mural never fades or during routine maintenance. Orange is a fun, warm, and contemporary color, but it used to be tricky to decorate with – until now that is. This wallpaper is a bold spin on a floral theme that will help you achieve your design goals for the nursery wall. Experts believe that an orange patterned color has a calming and energizing impact on people, making it the perfect mood setter for small children. The artisan chose to combine two different hues of white against a neutral off-white background to help the floral theme stand out. The careful use of white prevents the bright oranges from becoming too intimidating and foreboding, essentially allowing you to use just about any accessory in perfect harmony. This wallpaper is incredibly easy to install and remove, putting the power of experimentation in your hands. Spoonflower made sure to use a durable fabric to prevent wear and tear, in case the little ones decide to play around with the wall. Elevate the spaces with this elegant wallpaper that features different strokes of colors in a cartoonish format. Some artisans either add very few colors or exaggerate the color palette, which can look too strong for some viewers. This wallpaper is an example of a healthy balance between the two different extremes. This wallpaper is removable and can even be installed by the little ones just as easy. The best part about this product is that the decals are removable, which allows for endless experimentation. This earthly, rose-themed nursery wallpaper is bound to enliven your room due to the sheer eclectic appeal of the decals. The strong strokes of pink are counterbalanced by the saturated neutrals, while the delightful use of green is a chic, striking detail. 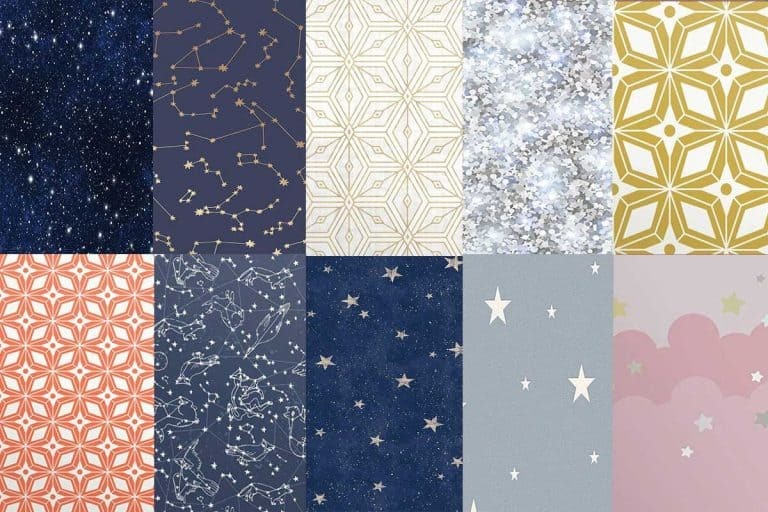 Spoonflower is known for its peel and stick wallpapers, and this product is no exception, it is fully removable without leaving traces of residue behind. This allows for endless experimentation, which is always a good thing. One cool aspect about this wallpaper is that the predominantly rose theme which is almost universally adored. This essentially means that you can, within reasonable limits, apply this wallpaper on drawers, shelf liners and other surfaces. Rose is recognized across the world for epitomizing meanings of purity, peace, and motherhood. This striking, feminine flower will become the pride of your nursery walls. The backdrop of a peonyflower is a great contender at becoming the focus of any room. A vibrant splash of neutral whites help the purple color pop out, while subtle strokes of white bring some balance to the mural. Dress up your nursery walls with chrysanthemums to inspire floral themes. This wallpaper exudes vibrancy and adds a luxurious feel to any wall. Your guests would be wonderfully surprised at the beauty of the flowers, and will likely think you actually hand-drew them on the wall. Making things easy is the ease of use, all you have to do is peel off and stick the wallpaper on a clean, smooth wall. The use of PVC material ensures that the wallpaper has several productive years after application. In addition, maintenance is relatively simple because you only have to apply moist rug to wipe away at any smudges and dirt. The purple flowers help create a sultry vibe while the lighter shade of purple backsplash add extra coziness to this nursery themed wallpaper. If you’re not a fan of purple, you can always choose a different color scheme, including white, blue, and black. This wallpaper is easy to apply, making it perfect for a DIY project to spruce up the walls with a nursery theme. The rose theme should resonate well with the young ones in the nursery, instantly setting the mood for peace and harmony. This wallpaper demonstrates how far ink technology has advanced, making it possible for lush floral designs to become a staple of interior décor. In this case, the beautiful blend between different floral patterns creates a softer, more welcoming atmosphere. Making this wallpaper stand out from other products on this list is the subtle leathered texture, which not only increases the wallpaper’s durability but makes it look all the more authentic. The vertical floral pattern repeats every 17.2 inches, so make sure to take that into account before ordering. If you’re in love with the idea of watercolors but are afraid to make a pick, then this wallpaper is just what you need. The wow-worthy mural will inspire you and the young ones in your nursery. The attention-grabbing print will reinvent a dull décor with a powerful statement. The durable fabric and ability to remove the wallpaper makes this product useful in nurseries, where you might want to experiment with different design ideas to fit your space. We encourage asking the children to brainstorm ideas about where to apply this chic wallpaper! What cemented this wallpaper’s place on our list is the fact that it can be applied on rough and uneven textures as well. 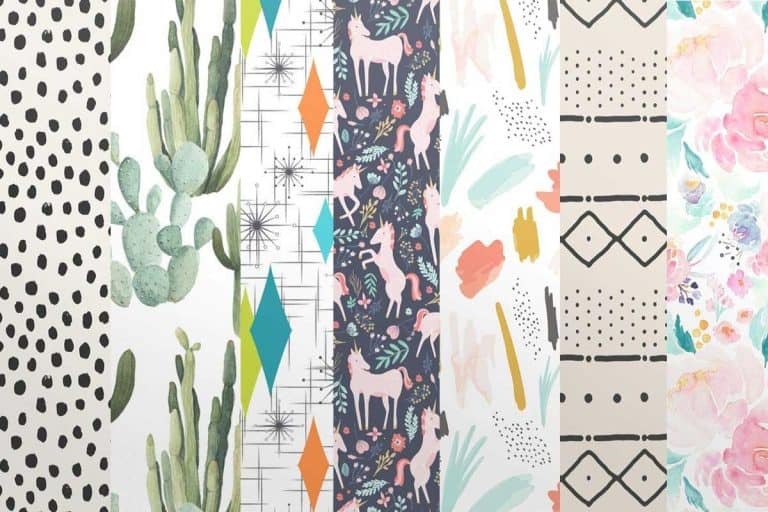 So if you’re not in the mood for some maintenance but still want to overhaul the nursery’s interior décor, then this wallpaper is for you. Click here to buy the wallpaper. Lotus flowers can easily transform your nursery’s room from otherwise lackluster backgrounds. The vibrant tones of green and white help make the room look as chic as possible, instead of boring and lackluster. This allows for easy maintenance without having to worry about the ink fading or the fabric being damaged. In addition, the wallpaper is removable, allowing you to experiment endlessly without leaving any residues behind. This nursery wallpaper creates a happy and stimulating environment for the little ones as they grow up. The soft flowers help to bring friendly designs and bold colors, and decorations. This helps to create a warm atmosphere that both you and your children will love. This wallpaper will make any nursery wall look inviting and let the room look clean, contemporary, and spacious. The wallpaper is highly durable and designed with longevity in mind. Do make sure to buy enough rolls of the wallpaper to ensure they’re the same color otherwise you risk chromatic aberration. Glow4u delivers yet again with their floral-themed wall art that makes careful use of different textures and colors. This gorgeous wallpaper will instantly create a wonderful impact on your room. As is typical of wallpapers from Glow4u, this product also comes with several features such as heat resistance, water resistance, and ease of application. Furthermore, the wallpaper is easy to cut should you want to decorate specific dimensions of your wall. The contact paper is thick enough to withstand wear and tear, allowing long term usage. The wallpaper is easy to apply, simply peel off and apply to smooth surfaces. You can get this wallpaper in the following size: 20.83 inches by 9.8 feet. Make sure to determine the quantity of wallpaper you’ll be needing before ordering. Enjoy decorating the nursey and making it into a perfect floral haven for your newborn!